The past week was full of the high end events, which were attended by the numerous female celebrities that never get tired of demonstrating the striking red carpet looks. For instance, the London premier of I Give It A Year was attended by Rose Byrne in Balenciaga dress, while Taylor Swift and Jennifer Lopez appeared on the screening of Parker in Los Angeles wearing Kaufmanfranco creations. Let’s take a look at other best celebrity looks of this January 2013 week. Emily Blunt chose Alexander McQueen dress complemented with a belt for the 33rd Annual London Film Critics’ Circle Awards in London appearance. Jennifer Lopez appeared at the screening of Parker wearing Kaufmanfranco dress in white hue along with Christian Louboutin heels and Salvatore Ferragamo clutch. Coco Rocha opted for the tuxedo layered with a black shirt for attending the DuJour magazine launch in New York. She complemented the look with stilettos and a fringed bag. Anna Frield let the London’s Vaudeville Theatre in the IDA bow blouse and wide-leg pants. Kate Bosworth attended the Calvin Klein’s dinner dedicated to the Sundance Film Festival premiere of Big Sur. Bosworth appeared in the total Calvin Klein look: she wore tan leather ensemble and white boots. Kate Moss went out wearing the black blazer layered with fur vest, wide-leg trousers. She accessorized the look with a crocodile clutch and stiletto shoes. Diane Kruger appeared at the Chanel Haute Couture spring summer 2013 show in Paris wearing the black and white dress, which she complemented with boots and a beret. Laura Bailey the same show in the knitted blouse and white-leg trousers. She also decided to accessorize her look with a beret. Sarah Jessica Parker and Alexis Broderick attended the opening of Patricia Broderick: Paintings and Works on Paper in New York wearing the dresses with floral prints. Miroslava Duma came to the launch of Cameron Silver’s book entitled Decades A Century of Fashion in the leather coat layered with a white shirt and knee-high boots. Vika Gazinskaya attended the same event wearing the original white dress, which she accessorized with fur gloves and Stella McCartney shoes. Natalia Vodianova looked elegant in the black suit and stilettos, which she chose to attend the Christian Dior Haute Couture spring summer 2013 show. 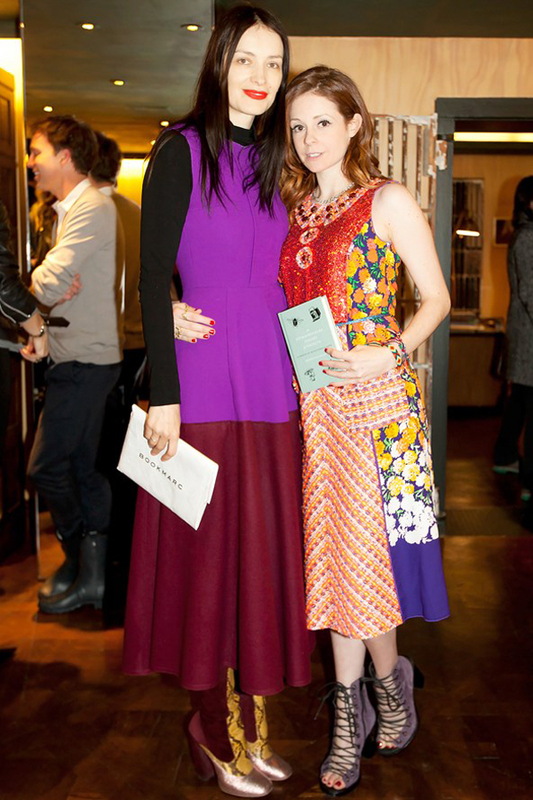 Roksanda Ilincic went for the dress of her own fashion brand to attend the launch of the book entitled An Extraordinary Theory of Objects in London, while Stephanie LaCava opted for Marc Jacobs dress and Ann Demeulemeester boots. Amanda Seyfried teamed the black blazer, skinny jeans, top and boots to attend the Lovelace premiere as part of the Sundance Film Festival. Lily Donaldson went for the devore dress and stilettos to attend the presentation of Berluti in Paris.